Most of the OOBD development work happens in the public, discussed and maintanced on Google Websites. If you don't have any google account at all, then go on www.google.com. 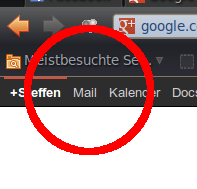 In the right upper corner you you'll find the button “log in”. Follow this link to create a new google account. If you have an Android mobile phone, you quite probably have already a google account, because you need this to go into the Android App market (aka as Play Store) to download and install any app onto your mobile. So by having this account already, you can directly go onto www.google.com and use the login button in the upper right corner to log in into Google using your existing android mobile phone account. So however you logged in into Google using either your mobile account or creating a new one from scratch, after login into Google you'll see a kind of menu bar in the top area of the google page. 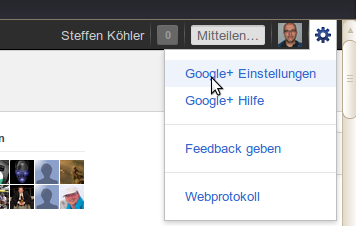 There you'll find on the left a link called “Me+” (“Ich+” in german). Please click on that. There you'll find a wizard which will guide you through the process to get also access to Google Plus. Google Plus is a social network which is in a way similar to Facebook, but by a closer look you'll find that Google Plus is different and e.g. takes much more care about your privacy as “other well known” social networks. You can fine tune everything about what is visible from yourself, and the default settings are quite restrictive, you are nearly invisible. The first, most lowest level one would be to just follow the OOBD+ Page. This is actual still a little bit boring, because there we just announce finished results, and as we are still deep in development, there's not so much finished so far.. The better choice would be the OOBD Community Page. Here we talking about ongoing work, which is at least in beta state. Google is quite good in respect your privacy, so Google avoids to send any unwanted mails to you. But this address is probably not your “normal” address, it is the Google-Mail address which you automatically get when creating your Google account. you'll get a confirmation mail to your normal email address, containing a link which you need to click to tell Google that your Email address is ok to receive forwarded mails. Just activate “Copy incoming Mails to…” and save your settings. 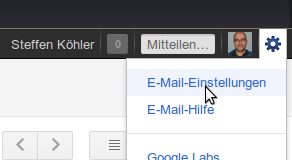 Now you will reveive a notification to your normal email address all the time when somebody writes a post in Google Plus, as long as the writer does not forget to turn the “Notification” flag on.